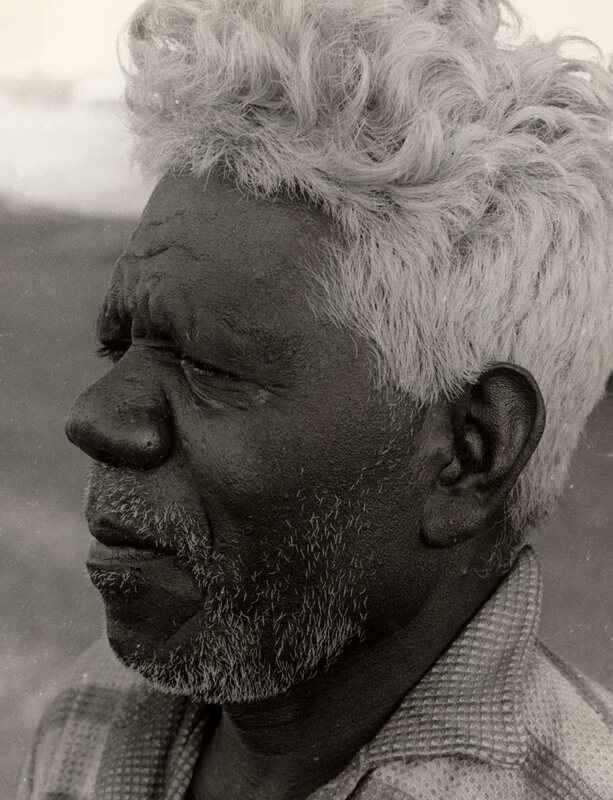 Tom Djäwa was the undisputed leader of Yolngu people at the small island community of Milingimbi in Arnhem Land from the early 1950s. He was the accepted Gupapuyngu Daygurrgurr clan leader at the time, but also wielded influence over others. As explained by Louise Hamby and Dr Gumbula, Djäwa’s son: ‘Djäwa was a wayirri watangu, hereditary owner in Yolngu law for Milingimbi. His mother was Djambarrpuyngu and his grandmother was Walamangu. This was a contributing factor to Djäwa remaining at Milingimbi and partially a rationale for his accepted leadership.’ In this position Djäwa was responsible for mediating between the Yolngu community and the mission staff, as well as providing extraordinary hospitality to visitors. Djäwa’s rise in power coincided with the establishment of Reverend Edgar Wells as the mission superintendent and the two worked together to ensure the stability of the community. They became close friends, and their collaboration and mutual respect led to a large number of high-quality artworks being created within the community. Wells noted that Djäwa used his interest in the arts ‘to his own advantage and invited clan leaders from other areas to visit Milingimbi and take part in various ritual activities’, as he sought to strengthen his position within the region. 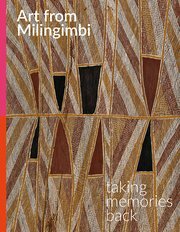 Such was their friendship that towards the end of their time in Milingimbi the Wells would often invite Djäwa and Wangurri man Baraltja to their sitting room for an ‘informal evening visit’ and to view slides of artworks. Wells’ wife Ann remembers that, in doing so, Djäwa ‘could tell the story of each thing as it appeared – where it was made, of which clan it was the emblem, when it would be used, and nearly always the artist who had made it. His memory was amazing when it came to lore and legends of his folk’. Djäwa valued the interest and respect he was shown by balanda (whitefellas) in matters of culture and Yolngu life, and it is telling that he worked with so many visitors who made their way to Milingimbi for a variety of reasons. He clearly saw the benefit in sharing his unique expertise and world view with interested parties and records of such collaborations provide an image of a figure who looms larger than life, someone revered within the community and deeply respected outside of it. Djäwa had lead roles in two documentary films made by Cecil Holmes, Faces in the sun 1963 and Djalambu 1964, which offers a re-enactment of the final burial ceremony for his father, Narritjnarritj. He also appeared in a documentary on bark painting made by the American collector Edward Lehman Ruhe, who visited Milingimbi in 1972. Djäwa worked with teacher and linguist Beulah Lowe and assisted numerous anthropologists who visited the island, including Ronald and Catherine Berndt and Ian Keen. The Czech artist Karel Kupka spent a considerable amount of time at Milingimbi between 1956 and 1973, and such was the partnership they established that Kupka came to consider Djäwa a brother, with Djäwa defining Kupka as the ‘white black fella’. In 1954 Djäwa was among a group of six men from Milingimbi who travelled to Toowoomba to dance for Queen Elizabeth II. Ann Wells felt that for Djäwa this ‘was a treasured and instructive journey into a new world’. In stark contrast to this event and to his position within the community, Djäwa was tasked with completing fencing as part of his mission duties. Over a 30-year period Djäwa painted on bark and made painted and incised wooden sculptures for the market, which are now held in collections across the world. His paintings vary from sparse compositions with beautifully rendered animals through to intricate, jewel-like works dominated by elegant geometric patterning and complex compositions that reflect his ceremonial seniority. Common in his work is the division of the composition into two sections, with a defined band transecting horizontally. His works also detail specific family responsibilities and connections.